Preparing with JobTestPrep's diagrammatic reasoning test practice materials can help you boost your final score at the assessment centre. Diagrammatic reasoning tests, often confused with abstract reasoning, inductive reasoning and deductive logical thinking tests, are aptitude tests administered by assessment companies. Unlike non-verbal reasoning tests, diagrammatic reasoning tests display a series of operators and outputs from which a candidate is to infer a set of rules and apply them to new situations. Learn about the most popular types of diagrammatic reasoning tests currently being used by various companies and organisations today. This test type includes a number of diagrams which contain combinations of letters that can be modified by different rules or commands. These commands are represented by numbers. Each number symbolises one rule, and these numbers may appear more than once in a diagram. However, the meanings of the numbers can vary from one diagram to the next. Your task is to follow the paths indicated by the arrows and determine the effect each command has on the letter combinations. Then, apply the commands to the corresponding problem. This test type includes a number of diagrams in which shapes can be modified by different operators. 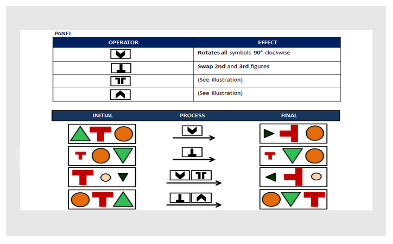 A panel illustrates different operators and their effect on different shapes. Your task is to infer the rules dictated by the operators and to apply them to new situations. Diagrammatic reasoning tests may seem overwhelming at first, but familiarising yourself with the concepts and time frames in advance will help you improve your performance on test day. Start preparing today and ensure your test confidence and success. SHL, Saville and other trademarks are the property of their respective trademark holders. None of the trademark holders are affiliated with JobTestPrep or this website.